Sometimes that old, gaudy wallpaper just has to go. Instead of paying professionals to come in and get the job done, remove the wallpaper yourself. With this simple how-to, you’ll have that yucky stuff gone and a clean slate for your stylish new look in no time. 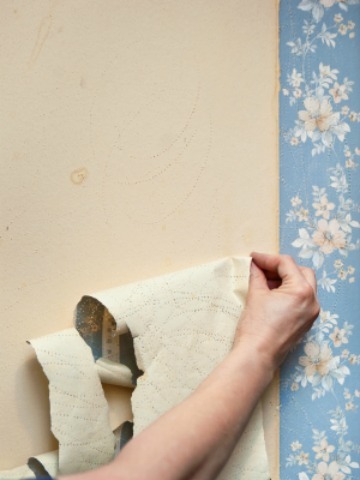 According to HowStuffWorks, it is possible to paper over old wallpaper by simply sanding down the seams and/or torn off sections and then applying the new paper overtop. But this method is definitely not advisable as the old designs or seams may show through the new papering and the additional moisture may cause both layers to peel off more easily. So, if at all possible, it is far better to strip off the old paper before applying your new selection. Some papers are dry-strippable. This means that they can be peeled off without the use of water or chemicals. You will simply need to apply the blade of a relatively dull knife to the upper corners and then gently pull the strip towards you until the entire length of the strip is removed from the wall. Repeat this with the remaining strips until all have been taken down. If you are not so fortunate as to have dry-strip paper on your walls, the process will take a little longer. Using a utility knife, begin by slicing horizontally across the paper every eight inches or so — not too forcefully, as you want to slice only the paper and not the wall behind. You will now begin the soaking process. Most wallpapers can be removed with either warm water infused with dish detergent or a combination of two parts water to one part white vinegar. The solution can be applied to the wallpaper using either a sponge or spray bottle. You want the paper to be as soaked as possible, so that the adhesive will break down and the paper will become detached from the wall. Dummies.com advises applying water only to a section that you can remove within 15 minutes, so you don’t have moisture sitting unnecessarily on the wall for too long. As a general rule, work on one 8-inch strip at a time. Let the strip sit for a few minutes before beginning the stripping process. You can reapply water if it seems to dry out. Using a wall scraper with a flexible blade, insert the blade under the edge of the soaked strip. Gently begin nudging into the strip in an upward motion. The wallpaper should begin to wrinkle and separate from the wall. Do this slowly, as, if the paper breaks, it becomes more difficult to remove the little pieces left behind. If a strip begins to show signs of breakage, resoak it, work on a different area and come back to it later. If this method does not seem to be working you may need to invest in a chemical wall-stripping product. If you are dealing with a very large room, this method may be too time-consuming and it might be worth renting a steamer from a tool rental shop. You will proceed in a similar manner, according to the steamer’s instructions, but it will take far less time. And most importantly, never be afraid to ask questions. If it doesn’t seem to be working as you expected, or you are having more trouble than you feel you should, don’t push forward blindly. Take a break and call a knowledgeable friend or a professional. The last thing you want to do is cause long-term damage to your walls. So, when in doubt, pause and find the best way to proceed. In no time you’ll have a fresh, clean wall for your stylish new wallpaper.